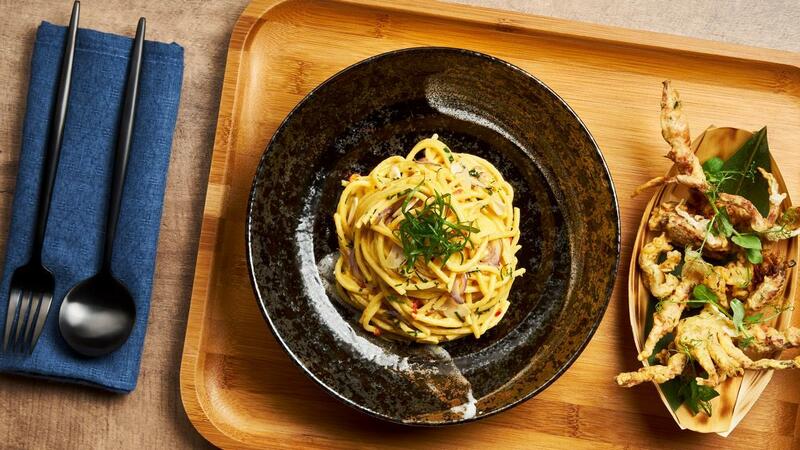 If your guests love Asian-fusion flavours, this could be their new favourite pasta dish. Why? Just try this combination of soft-shell crabs fried to a golden crisp, accompanied with a warm plate of pasta in a tantalising salted egg sauce. Coat the soft shell crab with corn flour and set aside. In a pot, melt margarine, stir fried curry leaf, shallots and chili padi till fragrant. Add in evaporated milk, water and bring to boil. Blanch pasta till Al-Dante and set aside. Coat the soft shell crab with the batter and deep fried the chicken wings for 6mins till it is cooked and golden brown. Heat up salted egg sauce, fold in pasta and let it simmer for 1min. Plate salted egg pasta and toppled it with fried soft shell crab. Garnish with chili, spring onions and affilla.